This beautiful handpainted Christmas ornament will light up your tree and be a wonderful addition to your holiday decorations. 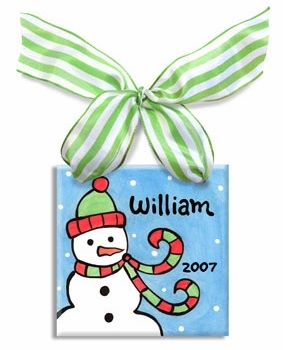 Handpainted on a blue background featuring a cheerful snowman wearing a cozy scarf and hat; each tile is finished at the top with a coordinating ribbon for hanging. 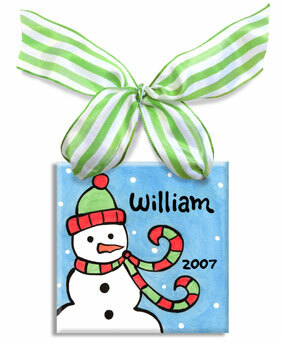 Personalized with your child's first name and year, each ornament is heat sealed using original artwork. Makes a wonderful keepsake. This makes an excellent gift, perfect for tree-trimming parties and for baby's first ornament.